Press Release (ePRNews.com) - Kennebunk, ME - Nov 14, 2016 - ​Dr. Patricia Leavy, a leading expert on women’s relationships, coined the term “low-fat love” to describe how women often settle in love and life. After extensive interview research, Leavy realized many young women settle for less than they want because they don’t think they deserve or can have more. She further contends women try to fake themselves out, pretending what they have is better than it is which can leave them feeling dissatisfied, isolated, and afraid to be unmasked. Low-fat love develops in the context of advertising and toxic popular culture that portrays unrealistic beauty standards that leave many women feeling that they don’t measure up. Popular culture also plays a critical role in how people come to understand what romantic relationships should look and feel like, as well as their importance, particularly in women’s lives. From fairytales to reality television, the same messages circulate: women are incomplete without a romantic partner, love is melodramatic, and it’s imperative to keep up appearances. It is in this context that many women feel like failures, as evident in Leavy’s research. Breathtaking! The pictures are glorious– emotionally compelling– those eyes, the pain, the fragility; the stories are captivating. Leavy teamed up with a visual artist and creative arts therapist, Dr. Victoria Scotti, to create something special out of the interview data. The result is a stunning collection of sixteen short stories with visual art, titled Low-Fat Love Stories. The pair termed their approach “textual-visual snapshots” in which the stories and images work in tandem to convey each woman’s story with all of its emotional texture. Each story is written in the first-person and draws partly on the woman’s own language from her interview transcript. The stories explore themes including: settling in relationships, the gap between fantasies and realities, relationship patterns, divorce, abuse, childhood pain, spirituality, feeling like a fraud, growing older, and daily struggles looking in the mirror. Beyond offering readers inspiration and a chance for self-reflection, the authors hope the visual images present a counter-point to the kinds of images typically seen in popular culture. While those images of women are often unrealistic and stereotypical, Scotti has created powerful images that convey pain, struggle, hope, and self-acceptance. Once upon a time and happily ever after take on new meaning as the stories and art reveal the underside of fairytales and popular culture. Patricia Leavy is an independent sociologist and novelist (formerly associate professor of sociology, chairperson of sociology and criminology, and founding director of gender studies at Stonehill College). She has received numerous awards for her work, including a 2014 Special Achievement Award from the American Creativity Association. In 2016 Mogul, a social media platform aimed at empowering women, named Leavy an “Influencer” alongside Chelsea Clinton, Melissa Etheridge, Nina Garcia and other notable women. Victoria Scotti holds a Ph.D. in creative arts therapy from Drexel University. She is an art therapist, artist, researcher and lecturer. A native of Estonia, Scotti shares her time between Spain, Estonia, and USA. Low-Fat Love Stories is a part of the Social Fictions series, the only academic book series that exclusively publishes literary works based on scholarly research. Series creator and editor, Patricia Leavy, started the series because she was frustrated that academic research rarely reaches public audiences. Believing in the unique power of the arts to engage people and fueled by research in literary neuroscience that suggests reading fiction affects readers more deeply than nonfiction, Leavy partnered with the academic press Sense Publishers. The Social Fictions series has become one of their fastest-growing and most successful book series, garnering numerous awards. 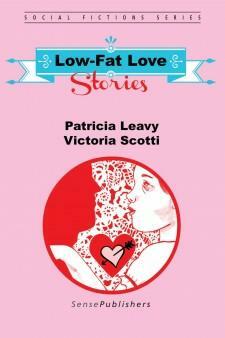 Leavy’s launch novel, Low-Fat Love, remains the most popular title in the series.